I realize this is just white noise. 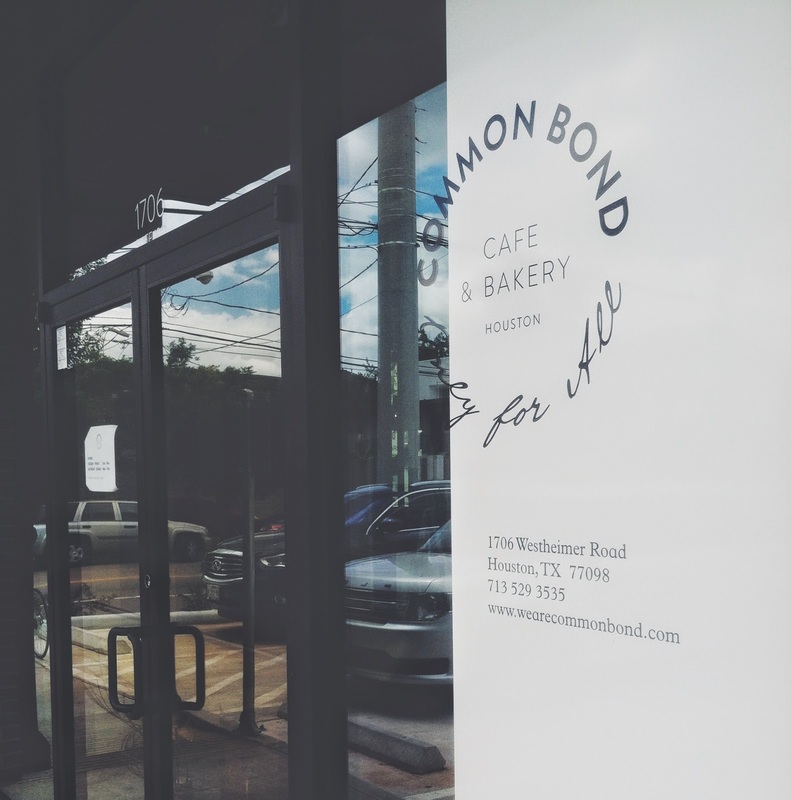 For the past few weeks, Inner-Loop Houstonians haven't been able to read the newspaper, peruse local websites, talk to their friends, or brush their teeth without hearing everyone raving about the newest "It" bakery in Montrose, Common Bond. And I don't know about you, but I only want to hear the musical timbre of Matt Lauer's silky voice narrating over to me from the living room when I'm brushing my teeth in the morning. Last week for my sister Emily's 22nd birthday my dad took her Las Vegas to see Billy Joel in concert (Ummm, how cool is that?). Before they left, she came into town from Dallas for one night, so I figured it was the perfect opportunity to grab a couple of treats from Common Bond to celebrate! First of all, how stinkin' adorable is their display when you first walk in? The interior of Common Bond is something you would see straight out of one of the schfancy homes on HGTV's Selling New York. And the dessert/pastry display, ehrmergerd. I popped by during lunchtime to pick up a few things to-go, and it was particularly busy with people dining off of the lunch menu. In addition to dessert, pastries, and lunch items, they also have gorgeous loaves of bread lining the back shelves. And while I could easily house a 12-inch baguette during one commercial break of The Bachelorette (who said that? ), I did not come for the bread. I came for the dessert. I decided to do a sampling of a few macarons, so I ordered one of each of the salted caramel, vanilla, peanut butter & jelly, and pistachio. Immediately upon setting the dessert out in my parents' kitchen, my mom and dad split the salted caramel in two and dove in before I could blink (so I have no idea what it tasted like...probably a combination of salt and caramel if I were to wager a bet). According to them it was amazing. The other three were delightful. I loved the quirky playfulness of the peanut butter and jelly macaron, the vanilla macaron was simple but satisfying, and the nutty sweetness of the pistachio macaron sent me through the roof. The outer cookie (cookie? biscuit? insert fancy French word here?) parts of the macarons were lightly crisped on the outside, but like clouds on the inside, and the inner filling was perfect and not at all overpowering. Long story long, I liked them. A lot. But my absolute favorite thing I ate that evening was the coconut eclair. I ordered a chocolate eclair as well, which was also very good. It was super rich though, so one bite was enough. But the coconut eclairs? I could have housed 17 of them during one commercial break of I Wanna Marry Harry. The coconut eclair was creamy, and fluffy, and sweet but not too sweet, and so light you'd think it was calorie-free! AND IT PROBABLY IS!!! No there's no way that's true. Regardless, if you're looking for an indulgent treat that's going to make you literally say "Mmmmmm" out loud several times, lick your plate clean, then kiss it on the face, look no further than Common Bond. And if their bread and lunch offerings are anywhere near as wonderful as their baked goods, sign. me. up. Even their packaging is so flipping adorable I want to give it a hug. OMG GET OUT. Oh no. I am ruined. Somehow I've been living under a rock and completely missed any announcements about this magical place. But good news: after stalking their Yelp page, I already know what I want: a fruit croissant, a kouign amann, a mudslide cookie, a chocolate chip cookie, a few eclairs, all their macarons and probably a few baguettes for good measure. I'm putting on my fat pants. No seriously Kim AHHHH why must you put this drool-worthy food in front of my face right after lunch?! Or at all? I'm going to annoy poor Erik so much until we go. I mean with places like this, why even go to Paris?! Yeah, it's seriously the bomb. I'm so sorry to have to do that to you. But in my defense, you post beautiful pancakes and cakes and delights on the reg, so you've been my inspiration for indulging in these amazing treats!